The “Land of Enchantment,” is proudly displayed on license plates in New Mexico. Most people think of Santa Fe when visiting this state locked between Texas, Arizona, Oklahoma, Colorado, Mexico, Oklahoma, and the tip of Utah. 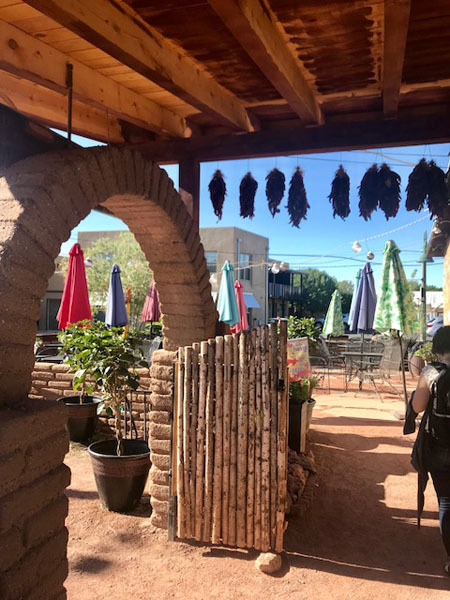 My travels were taking me to Albuquerque where the Native culture combined with New Mexican and Mexican influences is felt throughout this quirky city, from food to shops to the people. 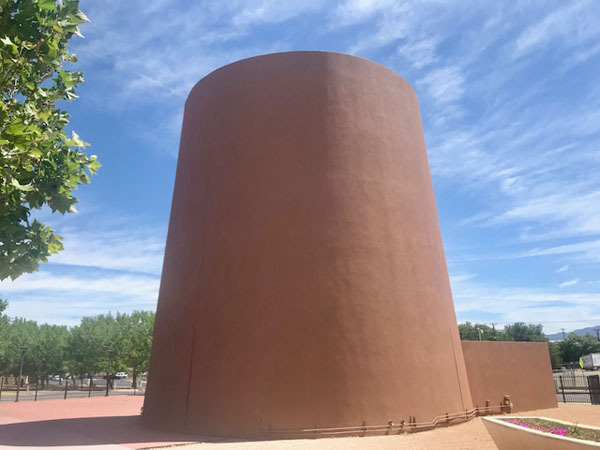 You don’t need to go far to experience the native culture since the state is home to 19 Pueblo tribes, two Apache tribes, and large portions of the Navajo Nation. This oasis in the desert offers unique foods influenced by the Native Americans, Spanish, and Mexican settlers simmered with the last 400 years of settlers creating a distinct regional cuisine. One word – spicy! Known for the best red and green chiles on the planet, everywhere I dined, my dishes included that unexpected kick, from guacamole to even gnocchi coming with a fiery afterbite. Albuquerque is a city that’s hard to explain, perhaps because it is unlike any city I have known. Not super cosmopolitan, but truly evolving with many businesses skyrocketing due to the hit shows Breaking Bad and Better Call Saul. More than $300 million in public and private investments are reshaping the city’s skyline. Albuquerque left me viewing my own City of Angels in a new light. 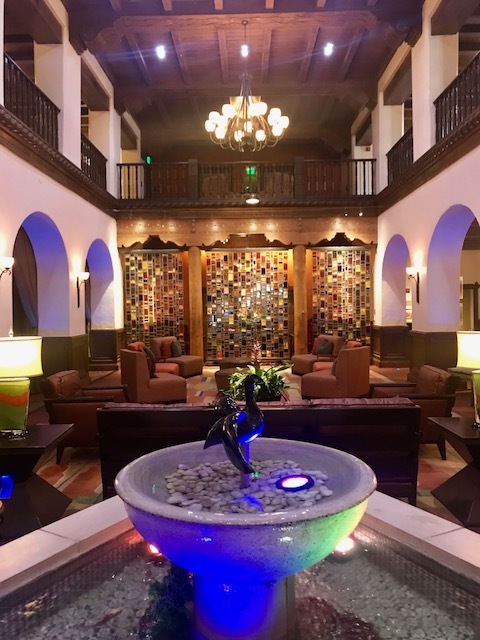 Although Albuquerque is frequented for its Breaking Bad tours and the annual international hot air balloon fiesta, there is more to this city than meets first gaze. Change your perspective and don’t miss these unique stops on your next trip to the Land of Enchantment. 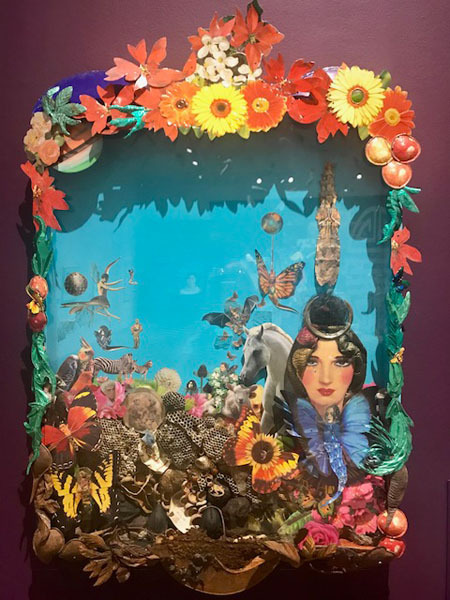 Don’t miss the impressive modern art collection with a thought provoking exhibit on race, gender, immigrants, and equality called Because It’s Time, Unraveling Race and Place in New Mexico that runs thru early 2019. The collection rivals museum exhibits in LA and NYC. This expansive campus celebrates Hispanic and Latin American culture and includes several performance venues as well as houses a 4,000 square foot bold colorful concave fresco painting inside a Torreon. 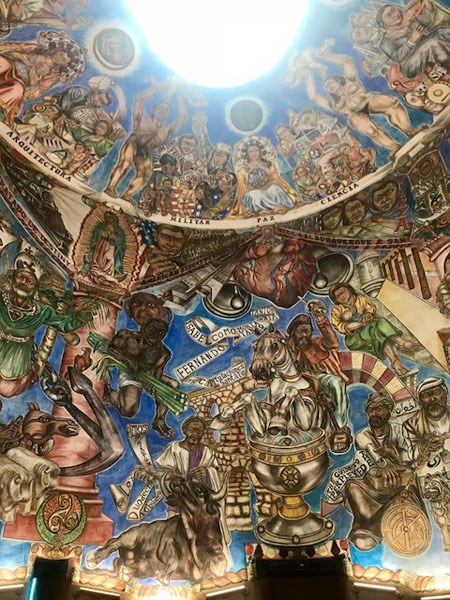 The largest fresco in North America depicts thousands of years of Hispanic history showing diverse cultural connections between people and places from the Iberian Peninsula to the Americas. Take at least 5-10 minutes to sit and gaze in awe at this impressive creation by Frederico Vigil, completed in 2009. Grab a paleta (all natural Mexican frozen iced pop often with fruit inside) at Pop Fizz next door. 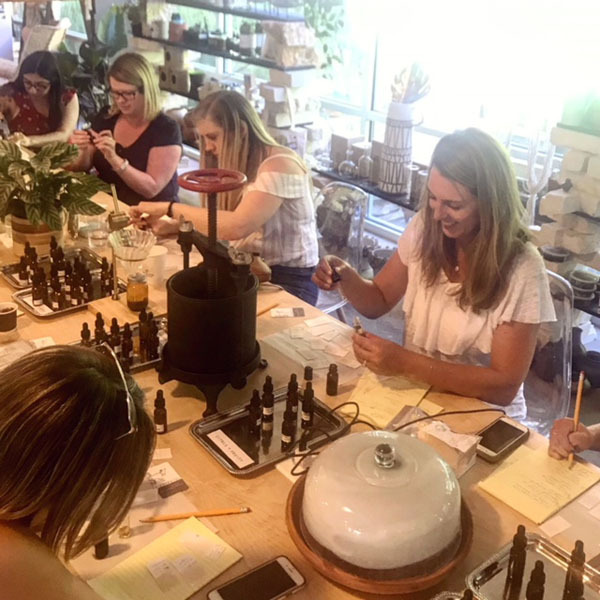 This live, work, and play area for visitors, residents, and business owners now offers a new hip shopping mecca called Spur Line Supply Co filled with local brands and burgeoning New Mexico entrepreneurs. 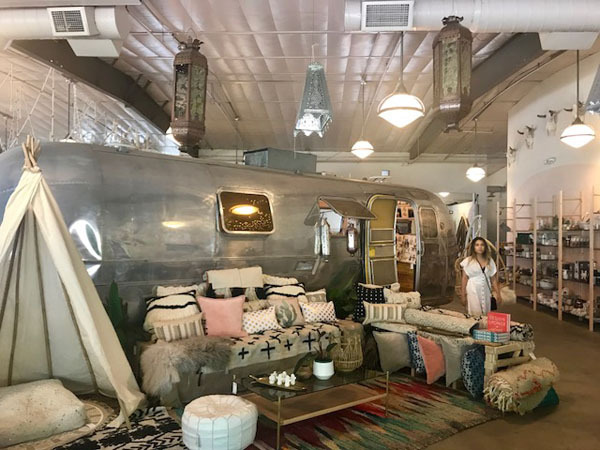 Shop for eclectic gifts or pose with their Instagram-worthy pillow plush Airstream inside. 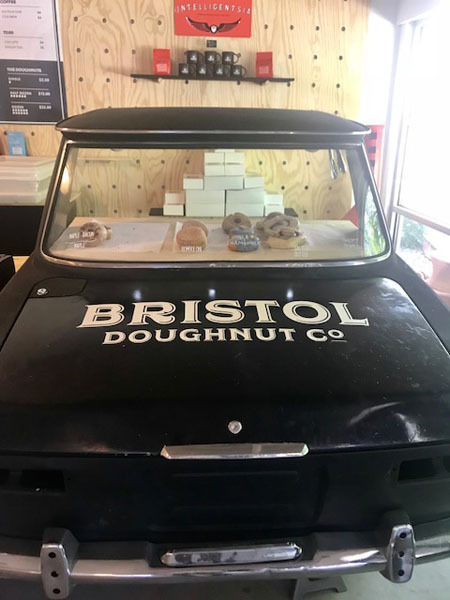 Don’t miss the area selling Bristol Doughnuts in a sawed-off car with flavors too good to resist like Vanilla and Earl Grey in lavender hues from the peaberry flour, Prickly Pear, Salted Caramel Bacon, and Bombolini stuffed with crème brule. Witness America’s first authentic Flamenco Tablao designed exclusively to feature the artistry of Flamenco. Arrive early to enjoying Spanish tapas and sangria in an intimate setting at Hotel Albuquerque. Transport yourself to Spain with the sizzling dancing, intoxicating guitars and singing thanks to the National Institute of Flamenco partnering with Heritage Hotels and Resorts. Open Thursday to Sunday at 8PM. Each show is around 20-25 minutes with an intermission. 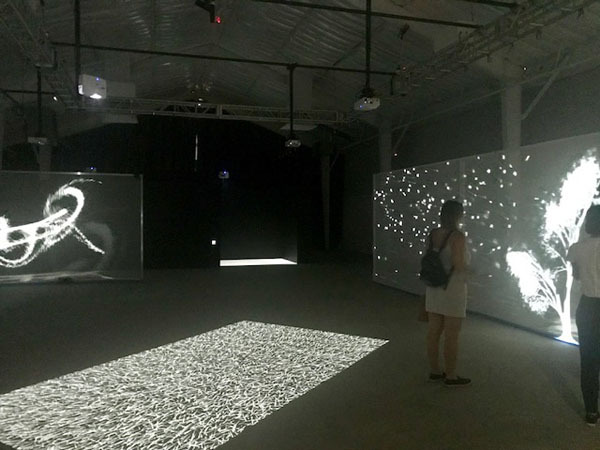 Newly opened in an Albuquerque warehouse, this interactive light immersion experience combines 10 digital landscapes for all ages to explore. The immersive sensory encounter lets you feel like a kid as you move your body to influence and play with the light sources on the walls, floor, and more. As art, science, and technology mesh, the newly opened digital art gallery traveled the world and landed here to let you have fun and take a lot of selfie videos. 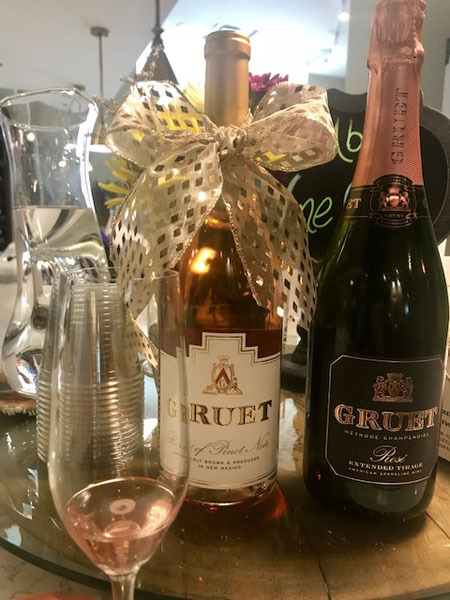 After living in California, I couldn’t imagine the landscape in New Mexico could hold and grow vines so when I was whisked from the airplane to Gruet Winery, I was pleasantly shocked by the quality of the bubbly at this adorable wine tasting room where in 1984 French Gilbert Gruet brought his roots from his champagne house in Bethon, France. Pop in for exceptional Pinot Noir and Chardonnay-based sparkling dry wines. Don’t miss the Sauvage Vintage 2011 or Blanc de Blancs Vintage 2012. Taste 5 wines for $13. The family owned winery surely has found a way to overcome and take advantage of bone dry soils, high elevations, and the dramatic day to night temperatures. 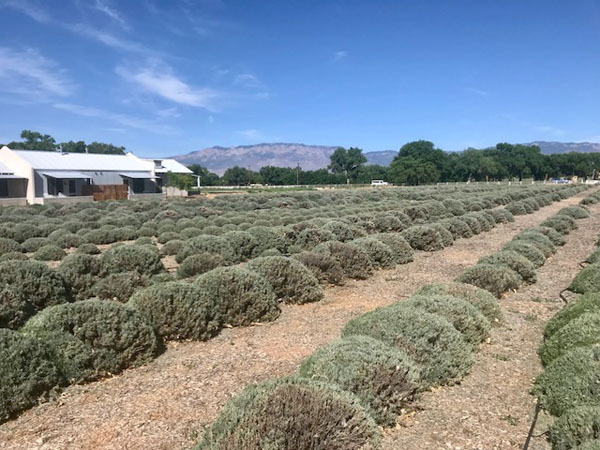 Sheehan Winery is another award-winning New Mexico wine made in small batches and quite sweet, which is the way the locals prefer it. 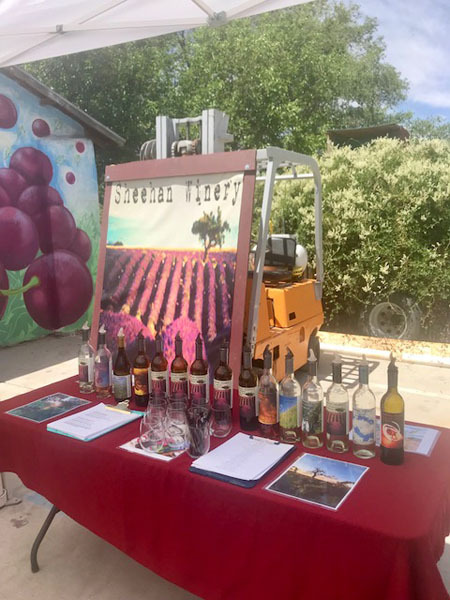 Perhaps the smallest winery in the world, Sheehan hosts complimentary tastings by appointment in the owner’s very own backyard where it is made and takes part in wine events throughout New Mexico a few times a month. Sean is gurgling over with passion for his wines and will be sure to entertain you over one of his artistically labeled bottles. 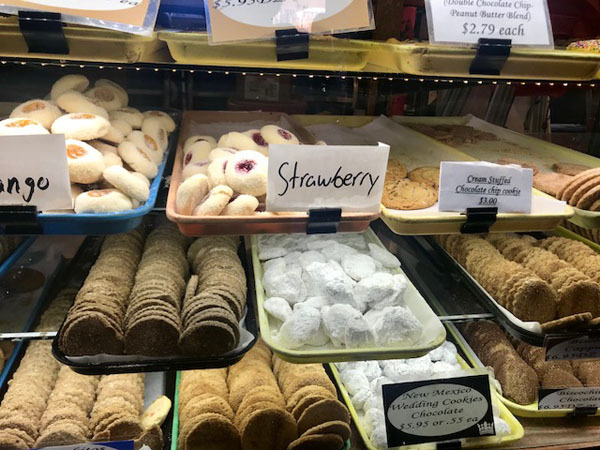 Stop in this old-fashioned neighborhood bakery that has been in business since 1972 for authentic New Mexico cookies called Bizcochitos traditionally served at special occasions and named the state cookie in 1989. Similar to various old Spanish sugar cookies, the scalloped round cookies are thin and crisp and come in many flavors. This cozy low-key spot also prepares latte art to go along with the pastries. Besides their cookies and New Mexican-style pastries, the 80-year old father son team invented New Mexican style pizza made from 24 ingredients – a blue corn and green chile crust. People dine outside and enjoy one of their many beers on tap with this New Mexico pizza. 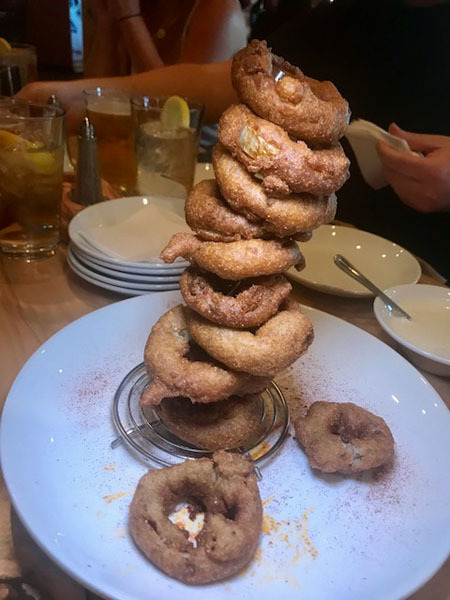 The duo also claims to be one of two bakeries in the world that can make anything out of bread, like 10-foot tall bread Christmas trees, and their ever-popular life-size bread Thanksgiving turkeys! Golden Crown Panaderia derived its name from their golden bread. This historic area boasts 150 merchants and is a great place to poke around and shop for Native American wares. Get your coffee and tea buzz at Blackbird Coffee House tucked in a corner. Eat at El Pinto, an old hacienda that specializes in New Mexican food. 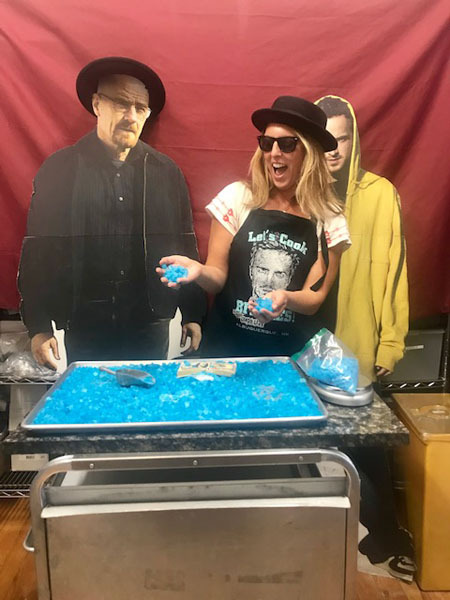 Breaking Bad fans shouldn’t miss the opportunity to buy $1 bags of blue candy meth from The Candy Lady and pose in the backroom with the “characters” from the hit show. Drive down the largest stretch of Rt. 66 in the USA and meander the eclectic shops and numerous hip restaurants and bars. Admire the Route 66 architecture and this area donned with neon signs. For a healthy breakfast spot with French flair, enjoy salads, soups, sandwiches with local and seasonal products. Poached eggs with prosciutto, roasted asparagus, and parmesan along with fresh squeezed OJ, Intelligentsia coffee, and a turmeric latte hit the morning spot. Eat outside or near the window like Walt did in Breaking Bad. Sleep in a work of art at this budget friendly hotel for rooms less than a $100. Each hotel room is designed entirely different due to the artists room project commissioning artists to create large scale installations. 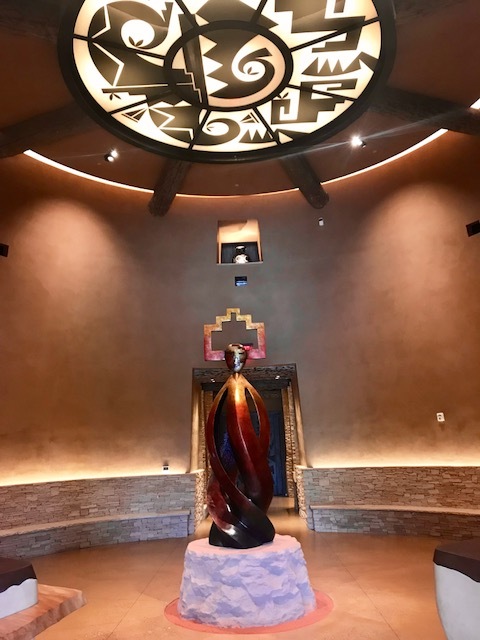 The Native American artists or artists tied to New Mexico that were chosen transformed each room with bold art showcasing their cultural traditions in exciting and surprising ways. 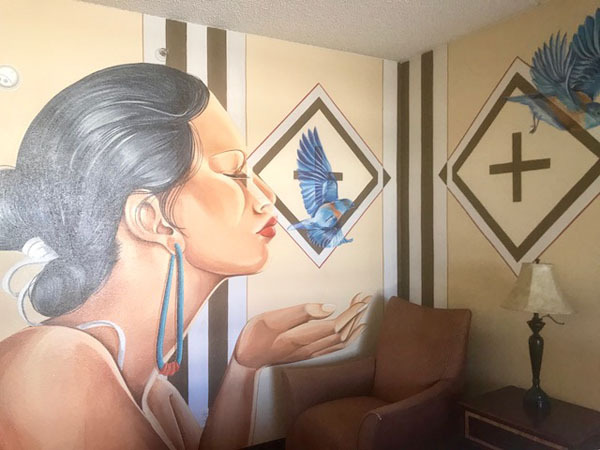 Artist Nanibah Chacon showcases a largescale chief’s blanket design and blue birds in several stages like the bird is flying off the wall. Kids can sleep in a tipi designed complete with 3-D glasses. 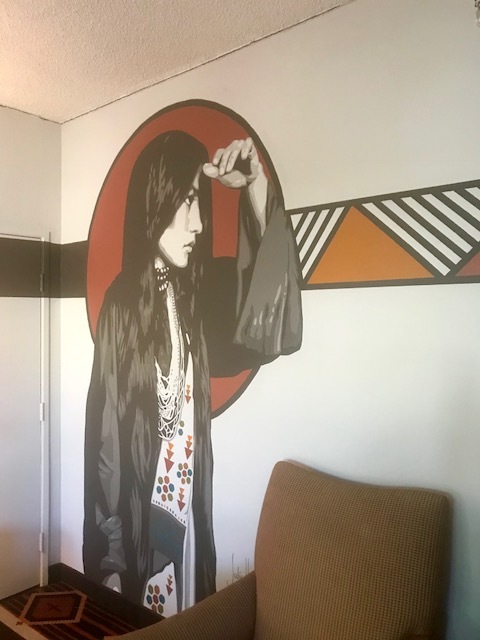 Artist Jodie Herrera depicted a lifesize beautiful Sioux woman to honor the sacred feminine and commemorate the native woman’s life fighting for civil rights, health care, and education for Native Americans. Voted Top 10 Hotels of 2017 by USA Today, this luxury hotel with 118 rooms is just over one year old. 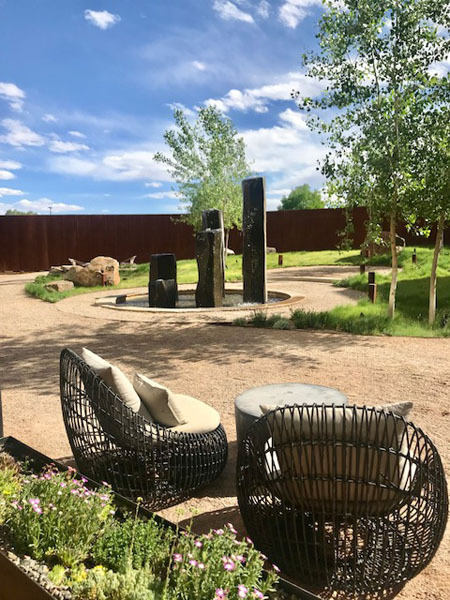 The grand design is inspired by the ancient civilization that once occupied Chaco Canyon, a Unesco World Heritage site, first occupied over 1,000 years ago by early Pueblo people. Works of art can be found throughout the hotel by many prominent New Mexican Native artisans. A natural colored weaving from master weavers of the Navajo reservation hangs in each room. If you don’t stay here, the hotel’s restaurant, Level 5 is worth a night out, with its stunning rooftop sunset cocktail and dinner views. The menu specializes in indigenous cuisine around the globe with a modern twist. 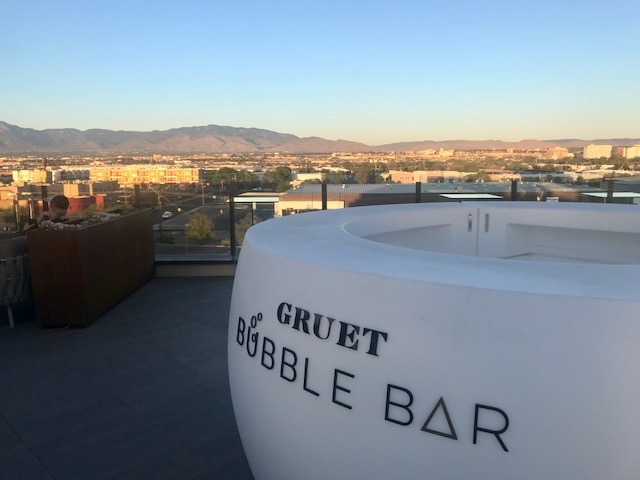 The rooftop is also home to Gruet Winery’s Bubble Bar. The historic boutique hotel is the fourth hotel ever built by Conrad Hilton and is where he stayed with Zsa Zsa Gabor in 1942 for their honeymoon. The foyer reminds me of a small version of the Hollywood Roosevelt Hotel. On the National Register of Historic Places since 1984, the Spanish-style property is the second historic property in the US to receive LEED Gold Certification. Their restaurant MAS is a worthwhile stop for tapas and wine. This peaceful sanctuary is nestled in the pastoral village of Los Ranchos on 25 acres. 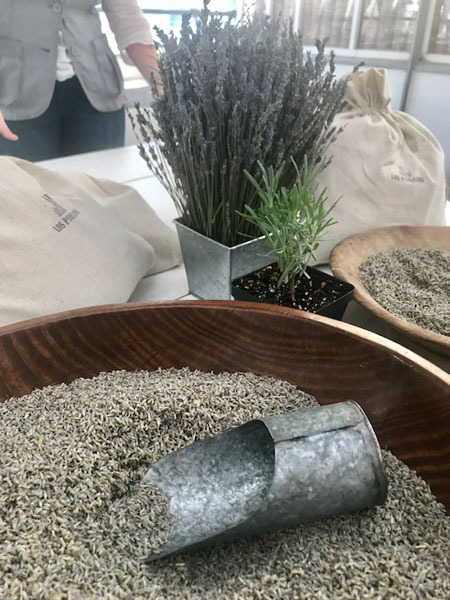 Walk through lavender fields with alpacas, explore their expensive farm store filled with artisanal lavender products, and dine at their open fire restaurant with lavender infused cocktails and dishes straight from their gardens. Fifty romantic guest suites are on the property with rose gardens to sit and find solace. Be ready to be enchanted by quirky Albuquerque.